Chinese manufacturing giant Foxconn has been in the news for all the wrong reasons lately, a spate of suicides at its Shenzhen complex attracting worldwide media attention. 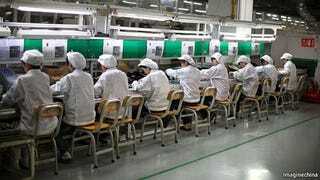 It's also attracted the attention of Sony, for whom Foxconn manufacture consoles. Like Nintendo, Sony has launched its own instigation into work practices at Foxconn's factories, issuing a statement which reads "In response to recent reports, Sony has begun taking steps to re-evaluate the working environment at Foxconn". The Japanese company joins not only Nintendo but also Nokia, Apple, Dell and HP in probing Foxconn, whose time in the spotlight is serving as an untimely reminder to Western consumers that the electronic devices we demand at affordable prices often come with a human cost. Foxconn stands accused of operating a "militarised" operation, with workers forced to stand, are banned from speaking and detained in factory dormitories.